2 x 12 Rockwell Antique Brass Floor Register Discounts Apply ! These antique brass floor registers will look great with any style of flooring. 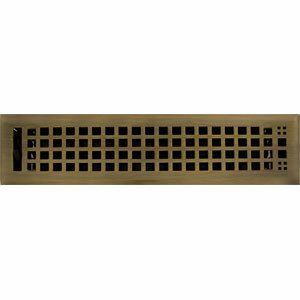 Metal vent covers feature a beautiful antique brass finish with a timeless design. Use antique brass floor registers to change the look of your home in just minutes. Metal vent covers are easy to install just drop into place and that's it. Your new antique brass floor registers offer function, style and ease of installation. These metal vent covers have a completely adjustable damper to regulate air flow. Your antique brass floor registers come with a protective coating to ensure a long lasting finish. ***Hint: The industry standard is to order using the actual hole opening size and not the faceplate size. These metal vent covers will fit a 2 x 12 inch hole opening. Spring clips are available to turn your floor register into a wall register. Order these antique brass floor registers today and update the look of your home!